"What did Mahesh do, Pa?" Josh interrupted his train of thought. He didn't really want a discussion on economics, politics or taxation. "He agreed," Rosh continued, "The guard let him pass. 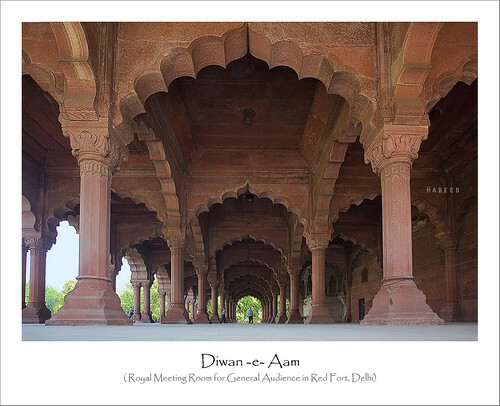 Mahesh walked through the royal gardens, mesmerized by the fountains, the neat rows of roses, and the magnificent buildings surrounding Diwaan-E-Aam." "Richly dressed courtiers thronged in the Hall. Uzbek generals, Rajput princes, Persian artists. People of many cultures surrounded him." "Towering above them all, in the far corner, sat a man. Upon a throne studded with gold and jewels. This was Akbar, holding his public court." "People curtsied and presented their problems. He sorted them justly and decisively. When it was his turn, Mahesh curtsied and handed back to the Emperor his ring." "Akbar inspected it, and asked to be reminded how it came to be in Mahesh's possession. Mahesh recounted the story of how they had first met so many years ago." "Akbar laughed with great pleasure, as pleasant memories came flooding back to him." "Khush Amadeed!" he laughed, "Welcome! Welcome to my Court! What can I do for you today?" The courtiers hushed at this unusually generous reception by the Emperor. 'Who was this shabby-looking man?' they thought. "I desire to receive a hundred lashings, My Lord!" answered Birbal. The Court was dumbstruck. Courtiers looked at each other, unsure that they had heard him right. Silence reigned. Akbar was surprised too. "What?" he asked, "A hundred lashings? Of the whip? Is that what you want?" "Indeed Sire," Mahesh said, and waited silently. "Why?" Akbar was perplexed, "you have done nothing wrong. You deserve no punishment." "I do, Sire," said Mahesh, "I had to bribe your guard to be able to present myself to you. He wouldn't have let me in otherwise." "What?" Akbar flew into a rage, "Who obstructed entry into my Open Court? Had you shown him my ring?" Mahesh affirmed that he had and recounted his tale. "But he still wouldn't let me in, unless he got half of whatever I received from you," he concluded, "so I seek a hundred lashings. And I'll happily let him have, half of them." "Then half he shall have," growled Akbar, "immediately." "Did you let this man in," Akbar pointed to Mahesh as he hissed at the guard, "on condition that you get half of whatever he receives?" The guard stared at Mahesh, stared at the ground, then fell on his knees with fear and nodded. "How dare you?" roared Akbar, "How dare you obstruct my people's entry into my own Open Court?" "Reham, Jahanpanaah," he yelped, "Mercy, Refuge of the World." Akbar signaled to his soldiers. The dishonest guard was promptly stripped down to his waist and given fifty lashings of the whip. As the guard was being dragged out in disgrace, Mahesh silently stripped down to his waist too, ready to receive his share of the lashings. "You deserve not punishment," Akbar said to him, "But reward. Some corrupt officers bring disrepute to the whole reign. They set a bad role model for the riyaya, the ruled." "I have tried to weed out corruption at my Court, but power corrupts faster than I can cure it. Your courage today will warn other greedy buggers and make them take heed. Stay by my side from now on and advise me in all matters. I need more people like you here." "But I must receive my fair share of the lashings too, Lord," Mahesh implored, "else people will call me a cheat." "Then you shall receive them too," announced Akbar, "at a future date I decree. In the meantime, to honor your bravery, I bestow upon you the name 'Veer Var' and the title 'Raja'." "Akbar regularly gave titles to his subjects and courtiers," Rosh continued, "In time, Mahesh's legend grew as his relationship with Akbar grew stronger. His stature amongst the common folk rose because of his constant pursuit of justice." "Vir Var meant 'the courageous one'. This title stuck to Mahesh Das, even though he did not write any history pages with his bravery or skill as a soldier. In his native Braj language and on the native tongues, it soon got distorted and became 'Bir bar' and eventually 'Birbal'. And thus the legend of Birbal was born." "So honesty does pay," Josh said, as they turned back towards their home. "Yea," Rosh responded, "but you need the courage of your convictions to see it through. And be prepared to pay the price. For there are no shortcuts to glory." "Individuals will continue to be tempted to choose the path of least resistance, but the long-term progress and survival of societies, cultures, businesses or governments can sustain only on sound ethical foundations and practices. So it is important to keep each other honest." "Did Akbar have Birbal lashed later," asked Josh, "as he had proclaimed?" "No," laughed Rosh, "there is no historical record of that. In fact, the historicity of many Birbal legends is suspect, but it doesn't matter to me, and I am your storyteller. This tale is part of the Birbal legend, has great story bones and moral, and there is sufficient wisdom and insight in it for me to marvel and take notice." "There is another version of the story, where Birbal asks for and gets half the lashings, before dramatically revealing his deal with the guard, to Akbar. But I think that 'lashing of Birbal' part is a much later addition to the story. It is obviously more dramatic, but it doesn't gel with the character of Birbal." "It doesn't fit the character of Akbar either. In allowing Birbal to be lashed, an invited guest, visiting him first time, in his own Public Court, without determining the cause ... there are just too many improbables, just too many inconsistencies, in that for me." "I think we've got to give Akbar more credit than that. He was Emperor and a living legend. He was the baddest boy, the master and commander in his Court, not someone who would simply follow along and do what he was told by his Courtiers or a visiting guest." "He had the intelligence, to recognize intelligence in others. Surround himself with it, honor it and retain it. Proof ? His Navratans. The growth of his Empire. The legends." "In having Birbal lashed before or after the guard was punished," Rosh concluded, "he would have set a poor example in allowing the honest to be punished like common criminals in order to punish the baddies for their wrong doing." Most crows on the street side agreed, but one little crow was lost deep in thought.